In a surprise move the Jameson Cult Film Club are bringing the future cult Legend of Ron Burgundy back to life for London, Leeds and Manchester audiences - this December. When the #JCFC preview Anchorman 2: The Legend Continues to UK audiences ahead of its 20 December release date. Tickets for the Jameson Cult Film Club screening of Anchorman 2: The Legend Continues are FREE, people simply need to join the Jameson Cult Film Club on Facebook and apply for their tickets via the Box Office tab at facebook.com/jamesoncultfilmclub later this week. Jameson Cult Film Club will host preview screenings for the year’s most hotly anticipated film, Anchorman 2: The Legend Continues before its release in UK cinemas on December 20th. The screening experience will open in London before heading on a UK tour visiting Manchester and Leeds. Guests will be treated to the usual Jameson Cult Film Club experience, immersing the audience into the world of Ron Burgundy. 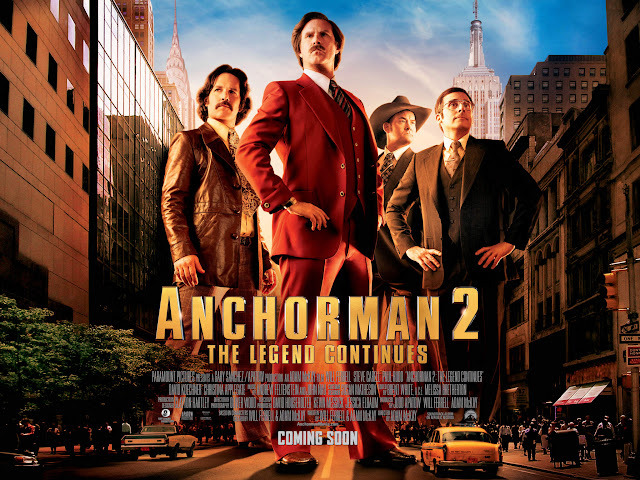 With the 70's behind him, San Diego's top rated newsman, Ron Burgundy (Will Ferrell), returns to the news desk in Anchorman 2: The Legend Continues. Also back for more are Ron’s co-anchor and wife, Veronica Corningstone (Christina Applegate), weather man Brick Tamland (Steve Carell), man on the street Brian Fontana (Paul Rudd) and sports guy Champ Kind (David Koechner) - all of whom won’t make it easy to stay classy…while taking the nation’s first 24-hour news channel by storm; so expect surprise jazz flute sessions, salon quality hair makeovers and Anchorman themed Jameson cocktails. Until next time I'll leave you with these quotes from the Breaking KVWN Channel 4 News team. The Establishing Shot: BREAKING KVWN CHANNEL 4 NEWS! JAMESON CULT FILM CLUB ARE BACK AND BRINGING ANCHORMAN 2: THE LEGEND CONTINUES TO UK AUDIENCES!